How's your weekend going? Mine is great - so far. I've been playing in my Craft Corner for most the day, working on some Easter goodies for the Grands. My last post was about the "Photo Inspiration Challenge" going on over at the Peachy Keen Stamps Blog. Have you played along with us yet? I hope you can find time to join us, the colors for this challenge are just beautiful. If you missed my card for this one, you can see it here. We also have a couple of fun challenges going on over at The Peachy Keen Connection. These challenges are to help celebrate the March Release! These are fun challenges and there are two $25.00 Gift Certificates up for grabs - but you've got to hurry because both challenges end Sunday, March 10th at midnight! If you missed my card for the embossing challenge, you can see it here. * Using Distress Ink in "Worn Lipstick", I stamped this gorgeous background stamp onto some pink cardstock. The name of this new release is "Grandma's Bathroom Floor" ! Guess I turned it into "Grandma's Wallpaper"! * Anyway, I glued the "wallpaper to the top portion of my card. Next, I cut a smaller piece of white cardstock and scored a line every quarter inch creating a "beadboard" look. * My next step was to cut small strips from my white cardstock, emboss them and use them for crown moulding, baseboards and a chair rail. I used a folder called "Scallops and Lines" from Sizzix. * Once my background was completed, it was time to add some Peachy Cuteness! This sweet little bunny is from the new March Stamp Set PKSC-15. This is just the sweetest stamp set ever! 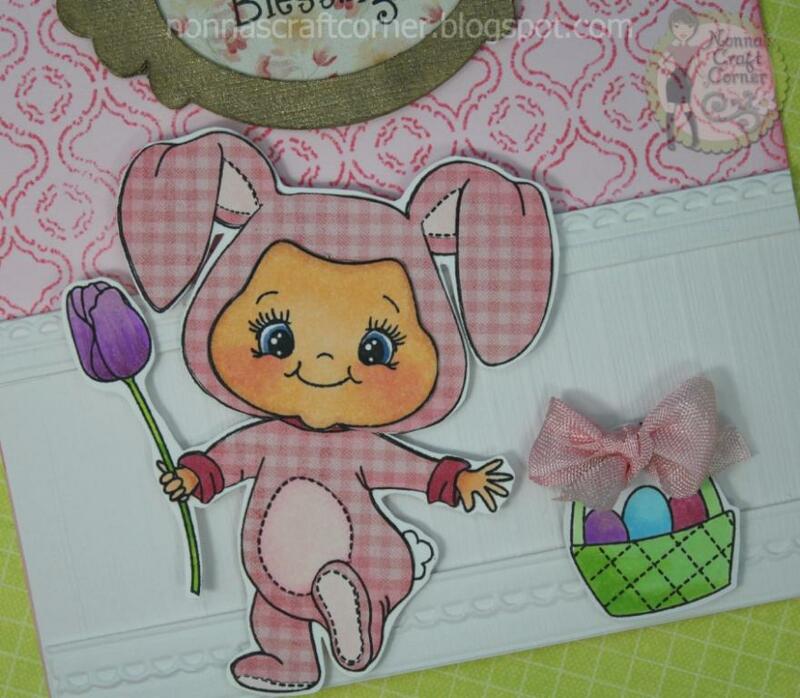 * I paper pieced that darling little bunny, coloring her face and tulip with my Copic markers. * I colored the Easter basket and added a big, fluffy bow made from crinkle ribbon. 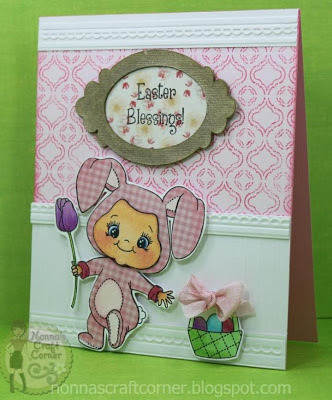 *Grandma's wall needed a bit of artwork, so I stamped the sentiment "Easter Blessings" (also from PKSC-15) onto some paper that had sort of a vintage feel to it. * My "frame" was created from a file I purchased at the Silhouette Online Store. I cut it out from white cardstock 3 times. I glued the layers together and colored them gold using a Copic marker. When the marker was dry, I spritzed my frame with Perfect Pearls Mist in "Heirloom Gold". I think it all came together to make a Grandma-worthy antique frame! This is one of those cards that came together bit by bit. I really had no plan other than creating a background of some sort. As I started working on it, things just seemed to fall into place and I'm really happy with the final outcome....some days you just never know! Well, I guess I've about talked on and on long enough here! I hope you can squeeze in some time to join at least one of the challenges we have going on right now...would love to see you enter all 3! Thanks for stopping by - enjoy your weekend and I'll be seeing you soon! What a GREAT card! The bunny is so adorable and I am so excited because I just ordered this set and can't wait to get it! Love the background-look fabulous! What a sweet little card, I love the embossing. You did a magnificent job on this card - especially the background "wall." And the PK stamp is adorable. This is another awesome creation Tanya!! I LOVE your creativity and of course those adorable PK stamps!! Thanks for sharing and have a GREAT Sunday!! This is adorable. Great colors and I LOVE that face. Cute, cute, cute. Love the details. I LOVE,LOVE,LOVE,...your Stinkin cute bunny!! Sending him a hug..lol! This new release is AWESOME! !The wall paper backround is BRILLANT!! Very CREATVE!! Love this Adorable card!! This is just so CUTE!! Absolutely love that little image, colored so beautifully. Love the wallpaper! Fab card. I think these may be my fav pk faces. Your "Grandma's wall" background is fabulous! It's turned out so wonderfully! 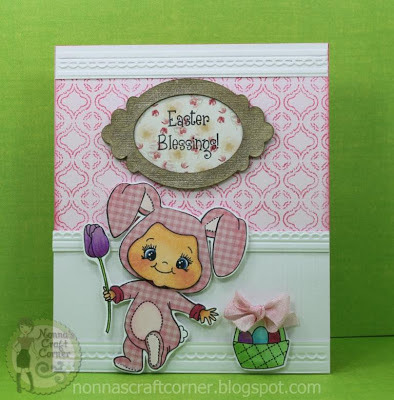 What a fun and adorable card, Tanya! Your card is fabulous Tanya. LOVE your wallpaper and all your intricate embossing not to mention the cute little bunny! Tanya ~ I would TOTALLY be happy with the outcome of this card!! The whole scene is so PERFECT! 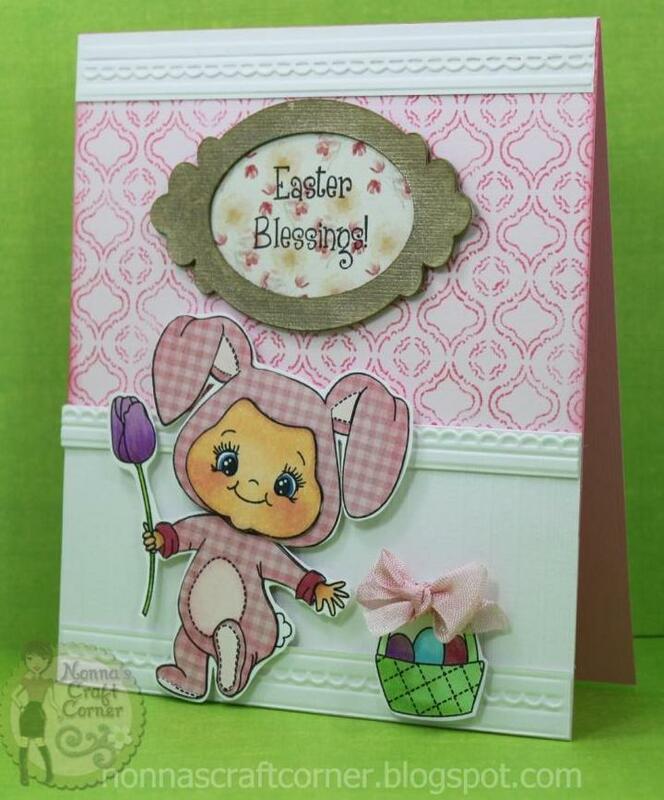 Of course I LOVE the little bunny and all but that baseboard and wall!! Then there is the frame ~ GORGEOUS! LOVE this too pieces!! This card brings up such a sweet memory. Years ago, when I had my ceramic shop, Donna's Molds had this great line of noggins and kids. This adorable little bunny totally reminds me of those. So precious! LOVE how you made this look like a home !! You are so flipping clever :) Awsome card as always !! Skipping by to say hi! Easter Peeps and a Give-Away! 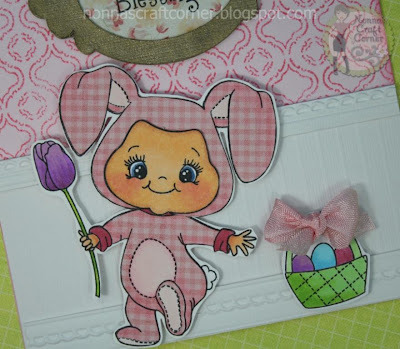 KaDoodle Bug and Peachy Keen Stamps! Peachy Keen Stamps Release Party!